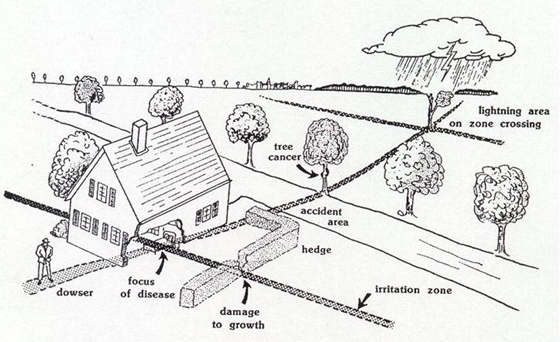 Various effects of geopathic stress of underground water veins as illustrated by Dr. Joseph Kopp. The word “ geopathic” is derived from the Greek words, “Geo” meaning “the Earth”, and “pathos” meaning “disease” or “suffering”, so literally “suffering of the Earth”. The term “ geopathic stress” is used to describe negative energies, also known as “harmful earth rays”, which emanate from the earth and cause discomfort and ill health to those living above. Earth energies can be bad, good or neutral. 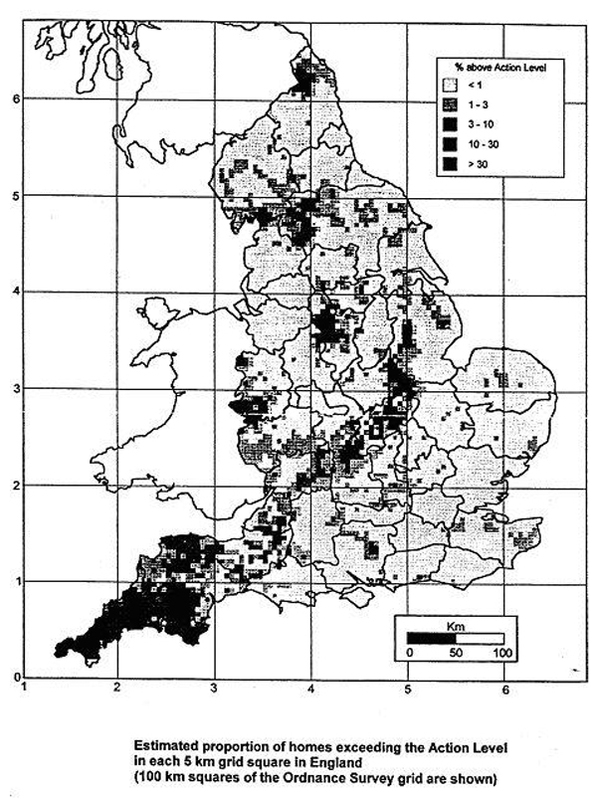 Just as local geology determines the local soil and vegetation, and therefore the whole natural ecology of an area, so it also affects human consciousness. People who live and work on clay soils are different to those on chalk soils in their relationship to their environment; those in river valleys different from those on hilltops in their vision of life. Many of the centres of concentration of holistic thinkers in Britain today lie in sandstone districts, the higher quartz content of sandstone perhaps amplifying the spiritual possibilities of human consciousness. The anciently-venerated sacred places of Delos (Greece) and Deya (Majorca) are both set in rings of hills high in ironstone. LEUKAEMIAS & LYMPHOMAS are particularly associated with a strong electropollution component within the GS lines. PREMATURE BIRTH,UNHEALTHY NEW-BORN BABIES, including DOWN’S SYNDROME and other GENETIC ABNORMALITIES. In the acupuncture tradition a point on the hand just distal to the fourth and fifth metacarpal junction (Triple Heater 3-1/3rd) is a prime Geopathic Stress test point, for both diagnosis and treatment. Case Study 01 – Brain Tumour (Leamington Spa – Warwickshire). Man with a brain tumour awaiting treatment. Geopathic stress lines crossing his head. 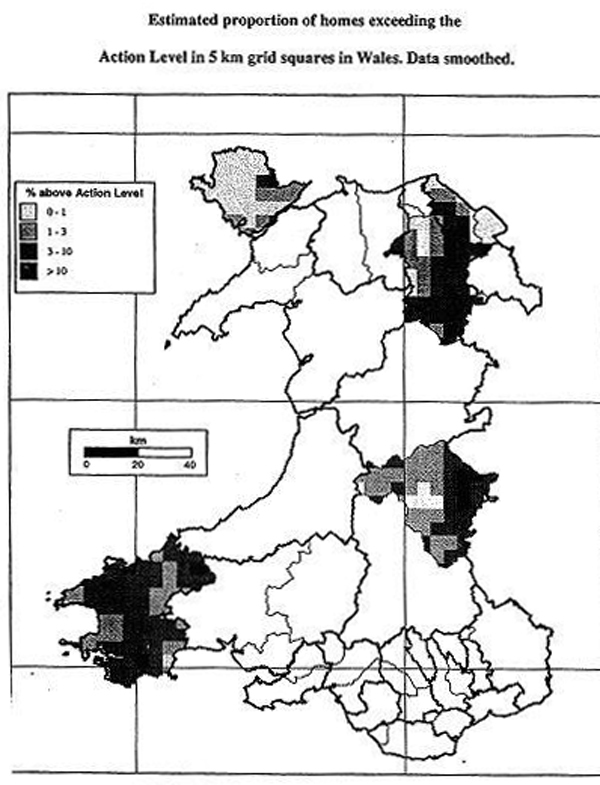 Case Study 03– Breast Cancer (Ipswitch – Suffolk). Woman with cancer of the breast. Hospital claims to have spent in the region of £100,000 on treatment over a two year period, and at one stage it was said to be cured but returned after a short remission. It is important to understand that it is necessary to remove the patient away from the radiation site before any treatment begins, since it has been my experience to find that no therapy works to its full potential when those being treated are left to sleep on the radiation site that caused the problem in the first place. 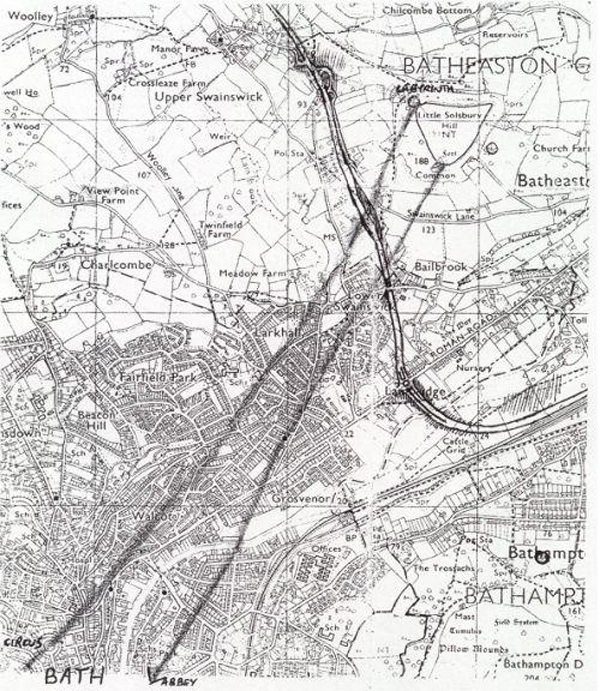 The combination of a subterranean water course intersected by a two banded Hartmann line is often found crossing the sleeping site of females with breast cancer. Case Study 04– Breast Cancer (East Grinstead – Sussex). Woman died from cancer of the breast after spending two years on this sleeping site. Male suffering from Parkinson’s disease, their cat slept on the floor near the bed and died from cancer after some 18 months on that site. 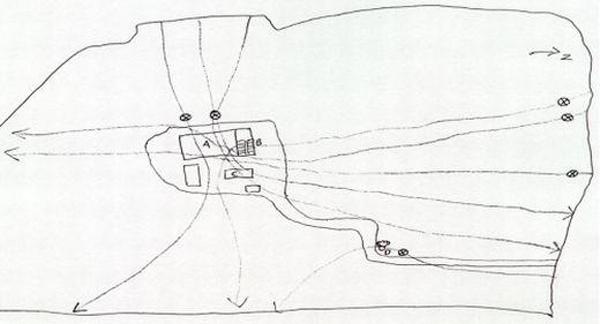 The problem resulted from two subterranean water courses crossing the sleeping zone and from my observations over the years this represents one of the most lethal combinations. Case Study 05 – Prostate Cancer (Mill Hill – London). Man with Prostate Cancer, not responding to medical treatment until I changed the chair that he sat on at his desk where he worked as CEO for some nine years, often for 10 hours a day. The chair he sat on had an anomaly measuring 47,000nT across the base of the seat. I made a through investigation of his residential and company premises, there were no other problems detected at either premises. There were many other chairs at his office not being used, after measuring the emissions with a Geo-Magnetometer, I selected the best one for his use. He went on to make a complete recovery. Study 06 – Throat Cancer (Hamlyn – Germany). Man with cancer of the throat. His first wife died from cancer of the throat when sleeping on the same side of the bed. When he married again, his second wife choose to sleep on the side of the bed that was free of earth radiation relegating her husband to the side formerly occupied by his first wife. Study 07 – Chronic Fatigue Syndrome (Dundee – Scotland). Man suffering from Chronic Fatigue Syndrome for the last four years having slept on this site for a period of five years. Symptoms: A severe energy depleted state, insomnia, depression, headaches, short-term memory loss, muscle and joint pains, candidiasis and food intolerance, not responding top any form of medical treatment. Case Study 08 – Chronic Fatigue Syndrome (Playa de Las Americas – Tenerife). Woman suffering from Chronic Fatigue Syndrome for the last two years having slept in that zone for just over three years. 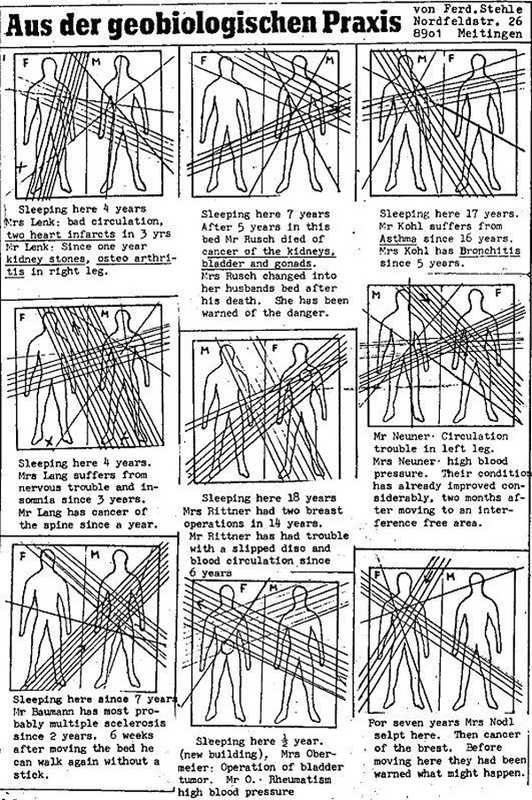 Symptoms: A severe energy depleted state, insomnia and candidiasis leading to an intolerance to a range of foods, the only type of hazard found to be a problem was the subterranean water course marked in blue on the chart. Case Study 09 – Miscarriages (Cambridge – Cambridgeshire). Woman suffered three miscarriages during a three and a half year occupation of this sleeping site. 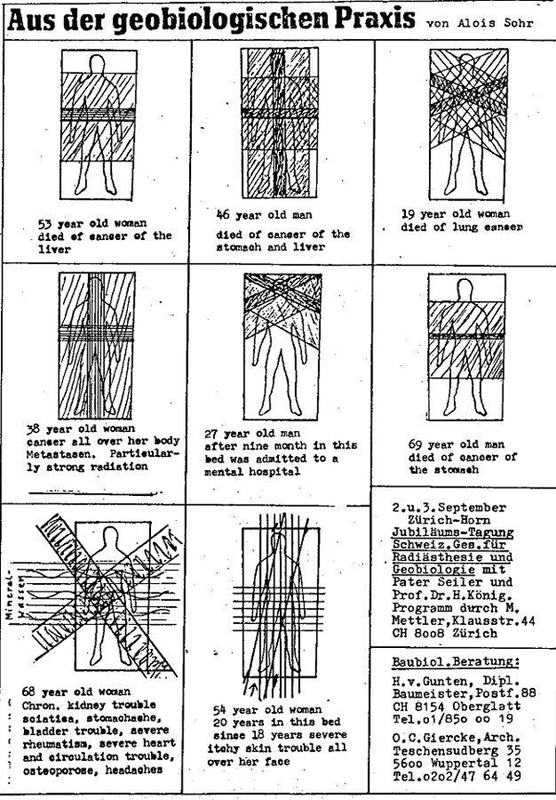 The subterranean water course recorded on the chart represents the type of radiation that is commonly found in such cases, and again it is my contention that the miscarriage results are due to altered states within the bio-electric messages transmitted at cell level that are essential for a healthy progressive development. Her daughter who slept in the next room was sleeping on the outside edge line of the same subterranean water course, and this was the only hazard found to be present within her bed space, and she was suffering from chronic fatigue syndrome, with a severe energy depleted state, insomnia, depression, migraine type headaches, short-term memory loss and hyper-sensitivity to light and sound. Case Study 10 – Multiple Sclerosis (West Hampstead – London). Woman suffering from Multiple Sclerosis. 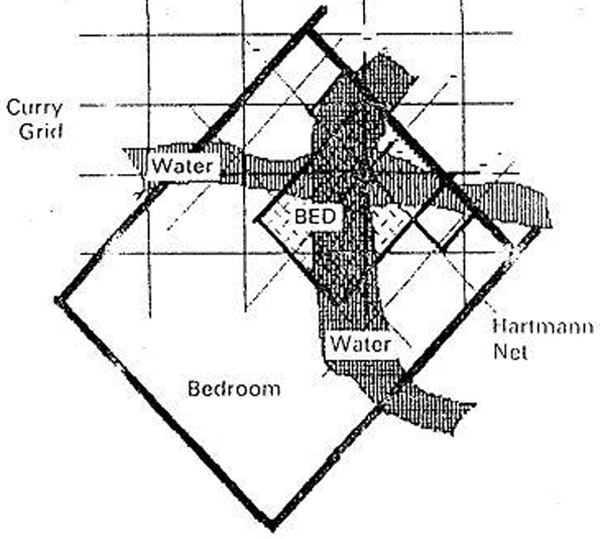 This represents a typical MS site with a combination of three specific types of radiation found to be present within the sleeping zone. The outside edge line of a subterranean water course, a two banded Hartmann line plus a highly disturbed magnetic field generated from the springs in the mattress. Example Two – Child with Cancer. Two-year old girl with germ cell cancer of the brain not responding to medical treatment. An anomaly in the earth’s natural geomagnetic DC field of some 32,600 nT produced by the springs in the mattress was measured over a distance of nine centimetres in the arepa of the girls head. (Remember that metallic ore causes changes in the Earth’s natural magnetic field. This ore has been refined to its purest form to make the springs of our mattresses). After changing the mattress for one which had no springs she responded to treatment with a successful outcome. Cats, owls, corvids, snakes, slugs and snails are however attracted to Sha streams, and a cat’s favourite sleeping place (in the absence of an obvious source of warmth) is very often a sure clue to the location of a Sha stream crossing. Local cats will gather in the neighbourhood GS hot-spot. A cat who regularly sleeps in the same spot on a bed is certainly performing a diagnostic, and possibly a protective function, though if the GS is too strong the cat will also suffer. Insects, parasites, bacteria and viruses also thrive on Sha streams, and ant and wasp nests invariably provide a similar clue: thus a Sha stream is the right location for a beehive. Case History 1. Solsbury Hill, Bath. 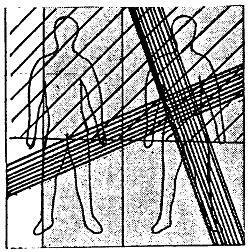 Geopathic stress lines. Farm near Airdrie, Scotland. 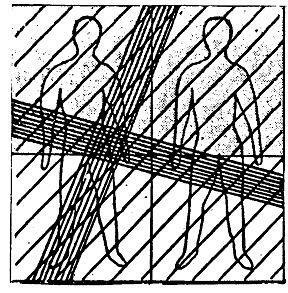 Geopathic stress lines. 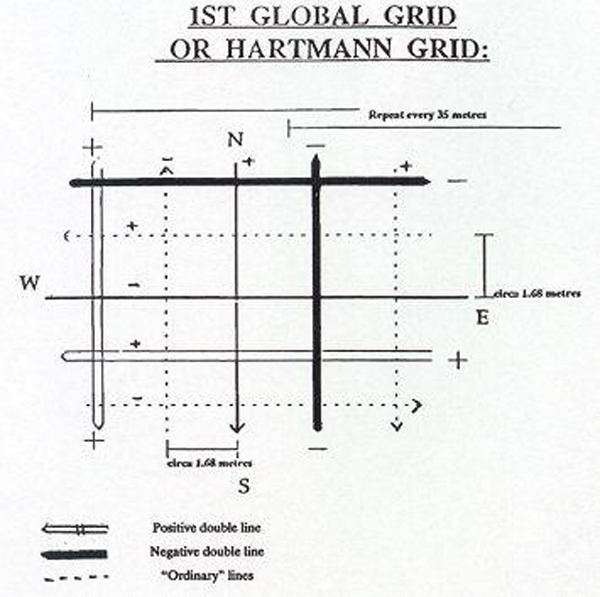 Hartman Grid. 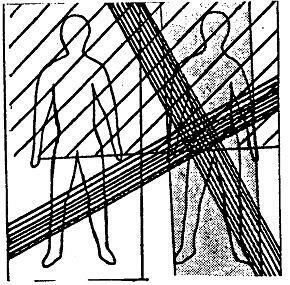 Between these geometric lines lies a neutral zone. 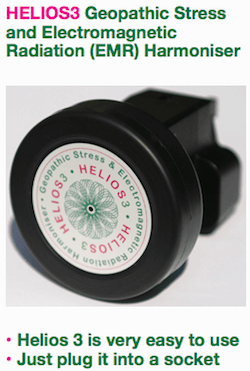 Geopathic stress theory is centrally concerned with radon-222, which has 86 protons, 136 neutrons, a half-life of 3.8 days, and decays to polonium-218 by shooting off an alpha particle, a process that may occur within our lungs. The newly formed polonium atoms quickly decay to other ‘daughters’: as these decay each atom first ejects another alpha particle, and then a series of high-speed electrons, high-energy gamma rays and fast neutrons. Christopher Bird, THE DIVINING HAND, 1979: “It was believed by the ancient Chinese that water flowed in subterranean courses called ‘veins of the Dragon’ (Lung Mai). Passing to and fro out of sight, the hidden veins of water served, like the bloodstream of animals, to remove impurities from the body of the earth… and to deposit curative minerals within it. 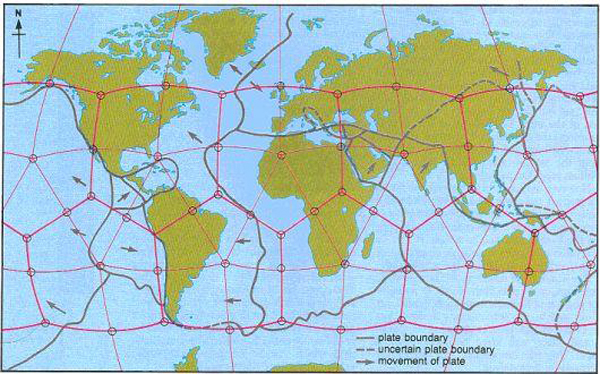 The earth’s circulatory system was matched by an ever-undulating network of currents in the atmosphere. The currents, running through Mai or channels, carried the Qi or vapours”. A doctoral thesis written by Barbara Tombarkiewicz under the supervision of Prof. Tomasz M Janowski concerning zones of geomagnetic field disturbances (magnetic anomalies) in Poland and the health of 309 cows kept in cow stalls in a building measuring 91 x 24 meters in area. Cows kept in three of these stalls suffered ill health problems over and above a ratio that might be normally expected. The problem was initially resolved by moving thes/stronge unhealthy cows to other cow stalls in the complex where they recovered. However the healthy cows that were placed in these three cow stalls soon succumbed to ill health probl The German dowser, Baron von Pohl, was asked to dowse the small town of Vilsbiburg in 1929, having then the highest per capita cancer death rate in Bavaria. He discovered a 100 per cent correlation between the beds of cancer victims and the paths of Sha streams passing through the town. He repeated the procedure in Grafenau in 1930, with the lowest cancer incidence in the province, and again found a 100 per cent correlation. He developed a scale to rate Geopathic stress of 1 to 16, where a combined tally of 9 or above from streams crossing gives rise to cancer.ems. 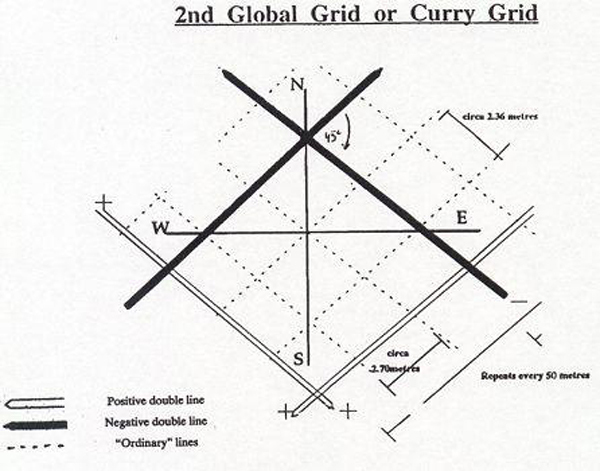 It was decided to take measurements of the Earth’s geomagnetic fields in these cow stalls to see if the three pathogenic sites were caused by anomalies in the local geomagnetic field strength. The three cow stalls that were connect to ill health problems had magnetic anomalies exceeded 34.000nT (nano Tesla). 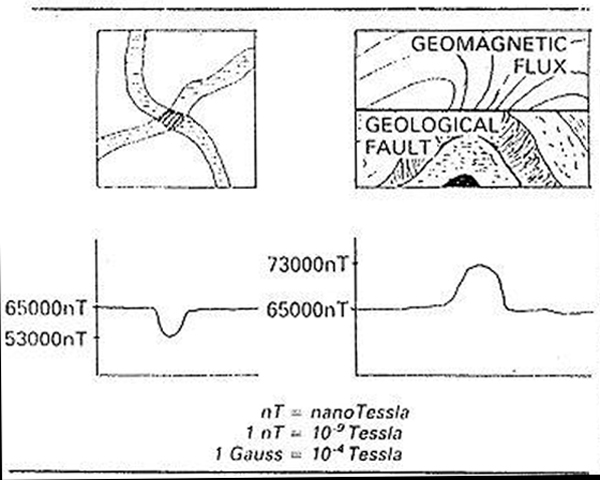 A disturbed geomagnetic field alters, among other things, the evolution-shaped permeability of cell membranes and the magnetic orientation of microelements. This can affect the whole plant or animal organism and thus the physiological status of the organism, the central nervous system and neuro-psychical phenomena. The influence of a disturbed geomagnetic field on the living organism is slow and cumulative in time and can cause dysfunction of the organism, but after it stops the dysfunction can regress. After several months the healthy cows were moved in to the geopathogenic stalls and were observed to undergo a reverse process as their hair turned gray, matted, and became poorly rooted in the skin. © Richard Creightmore 2007, Reproduction of this article on geopathic stress in whole or in part, is expressly encouraged (with appropriate acknowledgements please).